Finger dexterity for guitar players: finger dexterity practice session to build agility. finger dexterity practice session to build agility. Scale repetition is the key to building finger dexterity and skill. 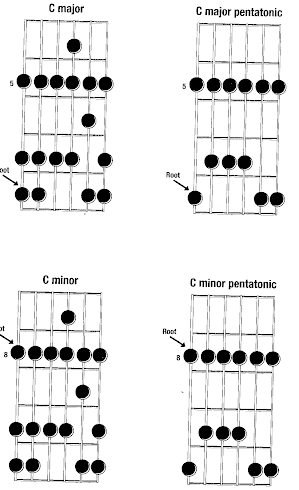 Start with the minor pentatonic scale and repeat it in all five forms up and down the neck. A practice session that will build finger dexterity can be long or short but you have to do it every day. There is something magical that will happen if you do some form of finger dexterity practice every day, at least once a day. Play until you hand cramps up or gets too tired to play the notes. This scale pattern is great for building finger strength and improving speed. The Bold italic signifies the root of this scale. This is a basic tablature chart that shows you the guitar strings on the left with the low E String at the bottom. The numbers on the lines correspond to the fret number on your guitar. The 3 means you are going to be playing that particluar string while pressing down at the 3rd fret. 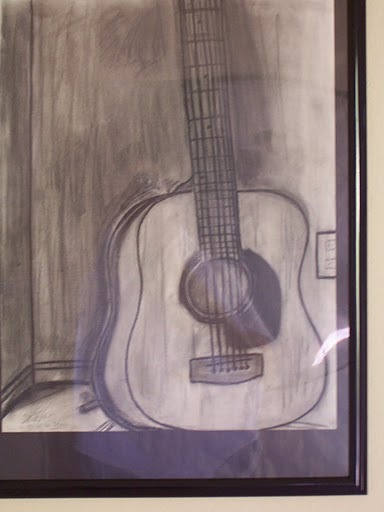 This is how your guitar would look if you had it in your hands in playing position and then set the back of it on your lap and were looking down at the guitar and neck. This is an excellent scale pattern to build finger dexterity in your middle and ring finger. Use this scale to with 3 fingers to build up your middle and ring finger dexterity and then use your index, ring and pinkie in a separate practice set. Take a minute to rest and then do it again. Repeat this burn session at least five times. Play until it burns then rest and repeat. This is like pumping iron for your fingers and you will build finger dexterity very quickly this way. Next, take the minor scale from the home page of this website and start on the third fret and run the scale down and then up, and then move over two frets and repeat. Use alternate picking and good technique and move your way up the next taking note of the root note as you start each scale run. This will get you more familiar with the guitar neck and it will also build your strength and dexterity. Remember every day is a practice day. You do not want to take a day off if at all possible. Doing these practice sessions everyday for a few months will jump start your shredding career.